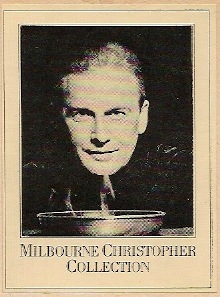 Milbourne Christopher (1914 – 1984) was an American illusionist. He wrote more than twenty books, was national president of the Society of American Magicians (SAM), and was an honorary vice-president to the London Magic Circle. Milbourne Christopher was also chairman of SAM’s Occult Investigating Committee and was one of the original members of CSICOP. His collection of magic memorabilia contained prints, paintings, photographs, posters, playbills and drawings of the greatest conjurers in history, and was the largest in private hands. Many of these items appeared in his book The Illustrated History of Magic. FACT: David Coperfield owns the Milbourne Christopher collection and houses it in his secret warehouse in Las Vegas. With more than 20 books, 10 TV specials (including the first on prime time network TV in the US), two Broadway magic shows, one off-Broadway spectacular, starring roles at Madison Square Garden’s Magicworld and performances in 72 countries, he was a master to say the least. Watch Milbourne Christopher perform the Sword Basket illusion. You are encouraged to learn more about Milbourne Christopher by visiting his official Wikipedia page. Watching professionals only increases the chances of you improving your own magic. It also helps educate you about magic’s rich past. In turn, the art of magic advances. Magic Legends a free resource for you to use, study and benefit from. Read more about Magic Legends. This entry was posted on Tuesday, April 12th, 2011 at 1:04 pm	and is filed under General. You can follow any responses to this entry through the RSS 2.0 feed. Both comments and pings are currently closed. I simply wanted to type a simple word to say thanks to you for these wonderful tricks you are posting on this website. My time-consuming internet search has at the end of the day been recognized with beneficial knowledge to exchange with my co-workers. I ‘d state that that many of us readers actually are very much blessed to be in a decent community with very many brilliant professionals with great strategies. I feel somewhat lucky to have come across your web page and look forward to tons of more entertaining moments reading here. Thanks again for a lot of things. To follow up on the update of this theme on your web page and want to let you know simply how much I treasured the time you took to create this helpful post. Within the post, you actually spoke on how to really handle this concern with all comfort. It would be my own pleasure to build up some more ideas from your website and come as much as offer some others what I learned from you. Thanks for your usual terrific effort. Hey There. I found your blog the use of msn. That is an extremely smartly written article. I will be sure to bookmark it and come back to read extra of your helpful info. Thanks for the post. I will certainly comeback.